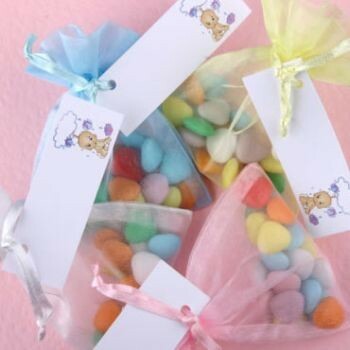 These shimmery organza bags are filled with sugar coated chocolates then finished with our baby label with a space for you to write your own special message to your guests. They are pretty pastel colours so will co-ordinate with any theme you choose and make ideal baby shower party favours or game prizes for your guests. Choose from pink, blue, lemon, white or a mixture of all 4 to give a colourful display. You could also use these to decorate your party table then hand them to guests at the end of the Baby Shower. If you order 10 or more of these lovely favours, we will personalise your labels FREE of charge. Please enter your personalisation details into the text box below.